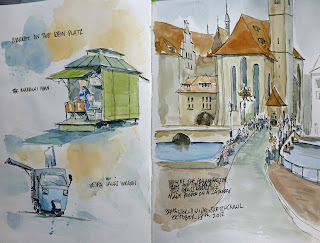 Urban Sketchers Switzerland: Better Late than Never! Glad you met up and set out to draw. Nice sketches! Next time I really hope no sickness, family birthdays or other emergencies will keep me from joining you. The sketches turned out great! Amazing use of water colors. hi Maria, welcome and great to see you here :-) Great as well how your sketches are representing last Sketchrawl that I've missed unfortunately. And next time, I will join you too! Also, wenn es mir reicht, bin ich da gerne mit dabei, das nächste Mal! Und sehr schöne schwungvolle Bilder.